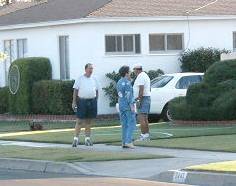 (October 8, 2002) -- Aircraft noise brought residents out of their houses in ELB's South of Conant neighborhood as a series of loud and large commercial aircraft and corporate jets were diverted onto neighborhood Runway 25-R for roughly two hours late this afternoon when LB Airport had to perform some unscheduled pavement maintenance on main (diagonal) Runway 30. 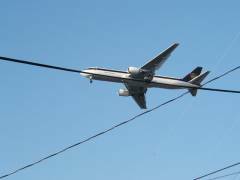 Starting at roughly 5:00 p.m., incoming flights (like the incoming UPS flight shown) were sent by the FAA onto ELB neighborhood Runway 25-R (the prescribed commercial alternate) which aligns roughly with residential Monlaco Rd. east of the airport and 36th St. west of the Airport. Incoming aircraft veered northward over eastern Los Altos, then dropped down over south of Conant rooftops approaching the Airport. In the neighborhood east of Bellflower Blvd. near Wardlow Rd., barking dogs signaled the approach of plane after plane, followed by roaring jet engines. 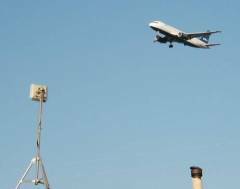 Among incoming flights detoured onto 25R were aircraft from JetBlue (shown over rooftops). Flights diverted due to repairs are not normally subject to any penalties since the diversion is not their fault. Some neighbors were clearly displeased. "Not good, not good," said one homeowner, shaking his head and closing the door. But Pat, a more philosophical long time resident surmised, "They must be doing some sort of repairs on the main runway." She was right. Airport maintenance was completed by 6:50 p.m. and normal operations resumed, interrupted briefly from roughly 7:50 p.m. to shortly after 8:00 p.m. as workers inspected their work to make sure it was holding up properly. Within that brief period, two additional large planes were diverted onto Runway 25R. Operations thereafter returned to normal.